Importer and destributors of telecommunication products in Benelux the Netherlands. Webportal created with in addition to a product database. All the products, information and documentation can be reached from the internet. This information is avaible for public. A special section is created for dealer to receive extra information, resources and software download. The concept is updated by a compleet content management system that can be reached from anywhere! Some features including: error handling, logging, front page image rotator, product search and products categorisation. IT Sales and services, also in Bonaire. Website created on behave of Computer City Aruba as a products showcase and client portal. Includes some features as Scroll text, image rotator and image slideshow. One of Arubian local news paper website. The english version of Bon Dia Aruba Newspaper. The housestyle of Bon Dia Aruba had to be kept uniform. Some features includes transparancy and framework to other websites. The content management system is included. 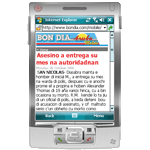 A version of the Bon Dia Aruba newspaper site, optimized for mobile device display. The Mobile version is attached, so minimal effort is needed to keep up to date. no horizontal scrolling on mobile device and other features added. To view the site, browse to www.bondia.com with a mobile device! A website dedicated to Aruba and the local language, Papiamento..
We assist and consulted in the setup and installation of the site. Specially proid to be doing something for the local people of Aruba. A website dedicated the successfull jouth of Aruba. We assist and consulted in the setup and installation of the site, and the first setup and layout. The flash introduction was not included! Website/portal for an online job center sign up..
Webportal created for a local small business manager as a login portal to register for online jobs, and also to be used as a product catalog. Website for a local distribor for office supplies and custumized invoice paper. Website created for a local small business to be used as a product catalog. The site will be extended and might provide the possiblity to order online. Website for the official Harley Davidson owners group of Aruba. Website for gallery image display and public news for the official Harley Davidson owner group of Aruba. Webiste has a login section intended for the group members only. Website/Portal for the lawyers group of aruba. Website created for the lawyers group of aruba for communication to the public and between lawyers, there will also be connections to other lawyers websites . Website/Portal to assist the local comunity with suggestions in their voting decision. Website created by TheUnion group of Aruba and the functionality was provided by Caribean Digital Corporation. The website consists of a front end and a back end where the results and statistics can be found. It has a Microsoft SQL server as backend database and .Net 2.0 technology.